size: about 65" by 6"
Strips are hand woven out of hand-spun cotton by master Malinke weavers from the UGAN Artisan Cooperative, Ivory Coast. The inlaid geometric motifs are traditional and each has a meaning, like the pineapple 'skin', panther teeth, the game of ware, cowery shells. 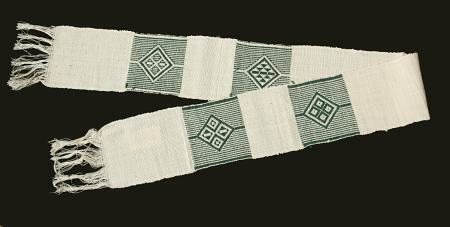 There are four motifs on eacg strip. Care: It is washable, but air-drying is recommended. Set iron to cotton and iron when still moist.